Official YouTHIN NV No Vitamins Loose weight fast! Persimmon Leaves, Malva Leaves, Milk Thistle, Marshmallow Leaves, Blessed Thistle, Ginseng, Sarsaparilla. Cover, and let STEEP for at least four to eight hours. This brings the herbs to full potency. Pour into pitcher with favorite sweetener leaving Miracle Tea bags in beverage until all is consumed. Refrigerate and it’s ready to drink. 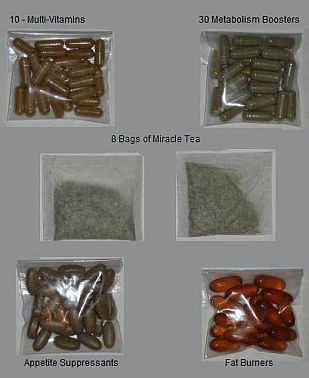 Miracle Tea can be mixed with any of your favorite beverages such as juice or other fresh beverage. If you prefer hot tea, do not heat in the microwave – use the stovetop. After drinking the gallon of tea, do not discard tea bags! The tea herbs are excellent for cooking. Dry the used tea bags and simply add to any food: soups, spaghetti, chili, stews, salads, potatoes, etc. Warning: This product contains cathartic herbs. Pregnant and nursing women, elderly, children and individuals suffering from any illness or health condition should consult with a physician before starting this or any other cleansing exercise of weight management program.